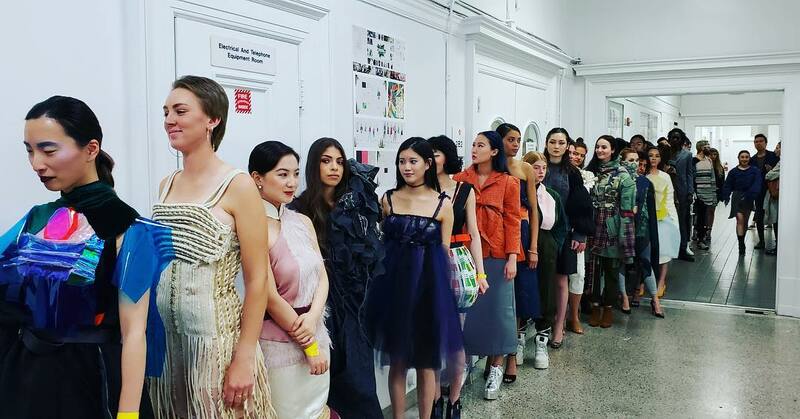 The Academy of Art University’s fashion club, Beyond the Front Row, turned the hallway of their fashion building into an environmentally conscious catwalk for the first event since the club’s re-launch. 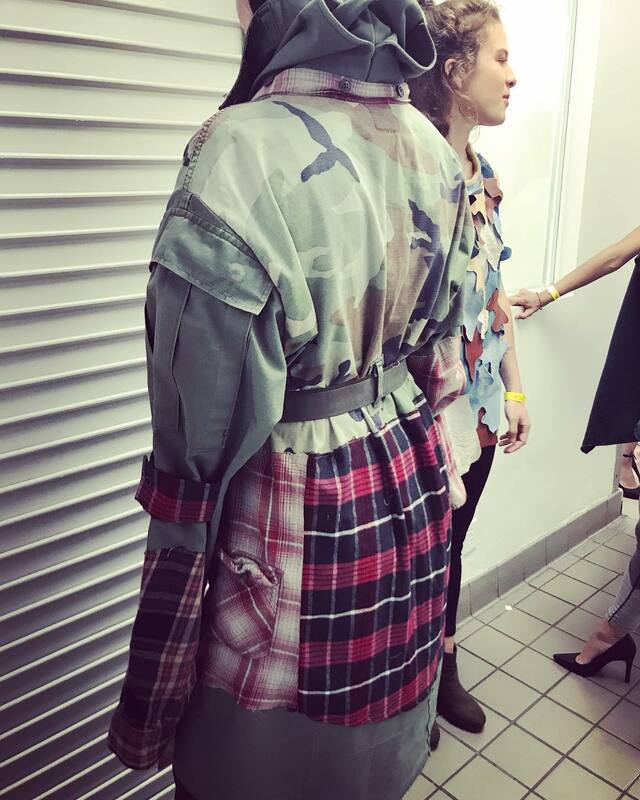 Called Runway Repurposed, the event was produced by the fashion club after Gary Miller, Fashion Director, challenged them to create a show centered around a sustainable design project for Fashion Design 2 students, who were tasked with creating looks made from repurposed materials. Zippers, seatbelts, traffic vests, tangled wires, PVC, cotton wool and clothing from Goodwill were just some of the unconventional materials used by the students to construct their garments. Many of the materials were acquired from Scrap, a non-profit creative ‘reuse’ center full of fabric and art supplies. Other interesting constructions included a leather top made by Alexandra Archibald from an old bag she purchased at an antique fair. Seyeon Park made an orange and green checkered dress using seat belts and buckles. Designer Faith Winston had a similar aim. 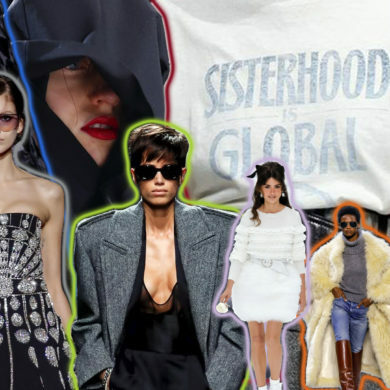 “The whole inspiration was women’s revolution, showing your feminist side,” she explained. With a corset constructed from leather gloves and belt buckles used as straps, her garment is reminiscent of a modern-day gladiator. Kristen Milsner made a dress entirely from ties from her father’s closet and Goodwill. “I got the inspiration from what is going on politically with women being equal. I thought about how I could bring a men’s aspect into women’s clothing,” she said. For many of the students, this is the first time their work is being showcased in a fashion show. Usually, students have to wait until their senior year to be featured in the graduation fashion show. Freshmen students and BtFR members Mursalin Mufti, Katie Smyth and Kristina Gross worked with MFA Fashion Design student Yi (Bonnie) Pan and junior Product Development student and BtFR co-president, Isis Bryant, on a collaboration dress, made by quilting different patches of fabrics. Instructor Wa Shan Yeung is equally as proud of his students. “They all very talented level 2 students. I am so glad that they were able to put everything all together in a short time.” He also thinks the theme of using repurposed materials is relevant to the way the industry works today. “Fashion clothing being made from recycled items is becoming commonplace today,” he said. 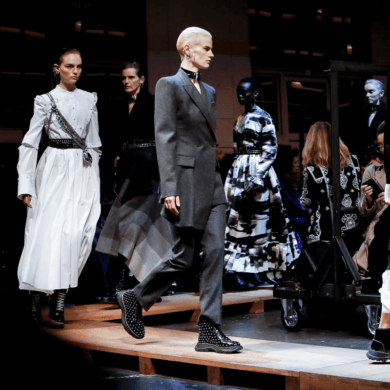 Previous Does Fashion Transcend Politics?